Customers expect more from brands when it comes to convenience, resolution times, and agent expertise. Evolving customer preferences are tightly linked to innovations in digital technology, and brands must embrace both in order to keep pace with heightened expectations. The good news is that brands that can deliver on expectations are rewarded with higher rates of customer retention and loyalty. 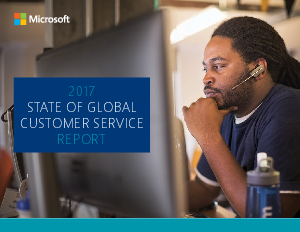 The Microsoft 2017 State of Global Customer Service survey polled 5,000 people from Brazil, Germany, Japan, the United Kingdom and the United States. We continue to find commonalities along with distinct differences between locals. And though people in all age groups are embracing new digital trends, millennials especially are shaping the way brands need to think about the future of customer service engagement.